A branch of accounting that observes and calculates the actual costs of a company's operations. Internal managers, rather than auditors, use cost accounting most of the time to identify aspects of their company where costs can be cut. For example, a manager may enlist a cost accountant to determine the most expensive aspects of his/her business that is, where the money goes. The accountant may make a detailed report so that the manager may make decisions based upon it. Because cost accounting is primarily internal, it need not conform to the Generally Accepted Accounting Principles. It is also called managerial or management accounting. See also: Assurance, Activity-based costing. The field of accounting that measures, classifies, and records costs. A cost accountant, for example, might be required to establish a system for identifying and segmenting various production costs so as to assist a firm's management in making prudent operating decisions. Fig. 28 Cost. Major elements of cost. The Department of Defense Financial Management Regulation (DoDFMR) provides the first evidence that cost accounting has never been a priority for the DoD. Many authors believe that cost accounting, as we know it, did not come into existence until after 1800 (Previts & Merino, 56). 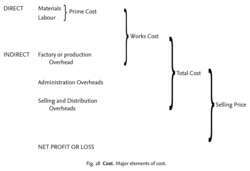 Cost accounting in the United States has regularly been criticized for not supporting managerial decision making and for inaccurate cost allocation resulting from widespread practice of allocating overhead costs based on direct labor. In the first part of the study, the nature of the cost accounting systems will be discussed followed by a review of the relevant literature. Updates and clarifies text regarding contract pricing matters and cost accounting standards. While some agencies were praised for showing leadership in the development of cost accounting systems, others were criticized for falling behind, particularly the IRS. One of the two largest OAs, the Federal Aviation Administration (FAA), was mandated to develop a cost accounting system in 1996, and had implemented MCA in two business lines covering over 80 percent of its budget. Math achievement, student age, gender and the length of time between taking principles and cost accounting are insignificant. Zeccardi's areas of expertise include real estate management, construction management, labor negotiations, job cost accounting, budgets, local law compliance and Class "E" fire alarm installations.